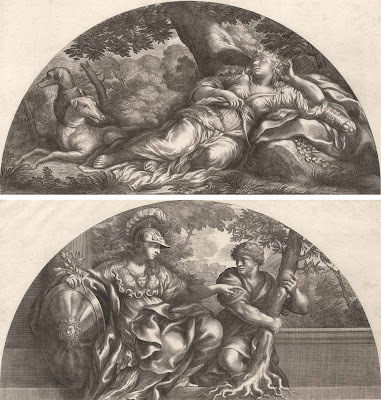 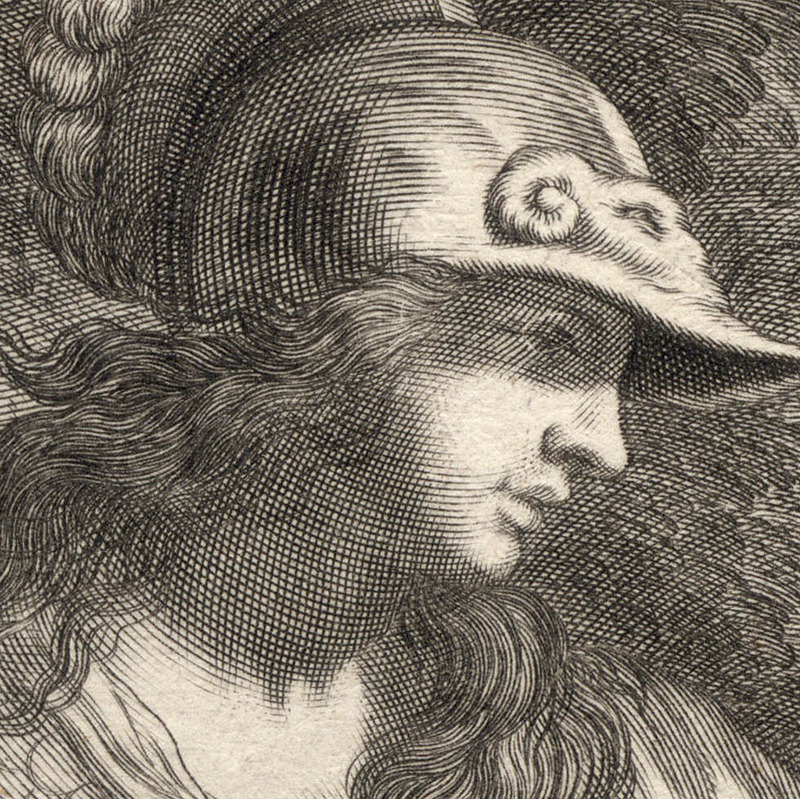 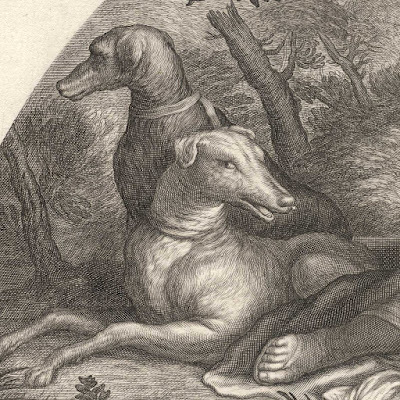 “Diana” (upper image) and “Minerva” (lower image), c.1677, from the series of 15/26 unnumbered plates, “Heroicae virtutis imagines” (Images of heroic deeds) (for information about the series see: Anna Grelle Iusco 1996, “Indice delle stampe de' Rossi”, pp.454 [pp.62-63]) and the series of 4 plates, “Four gods to Pietro da Cortona”, after Pietro da Cortona’s (1597–1669) frescoes in the Palazzo Pitti in Florence (for information about these frescoes in the Sala de Giove [1642-43/44], see: M Campbell 1877, “Pietro da Cortona at the Pitti Palace: A study of the planetary rooms and related projects”, New Haven), published by Giovanni Giacomo de' Rossi (1627–1691) in Rome. 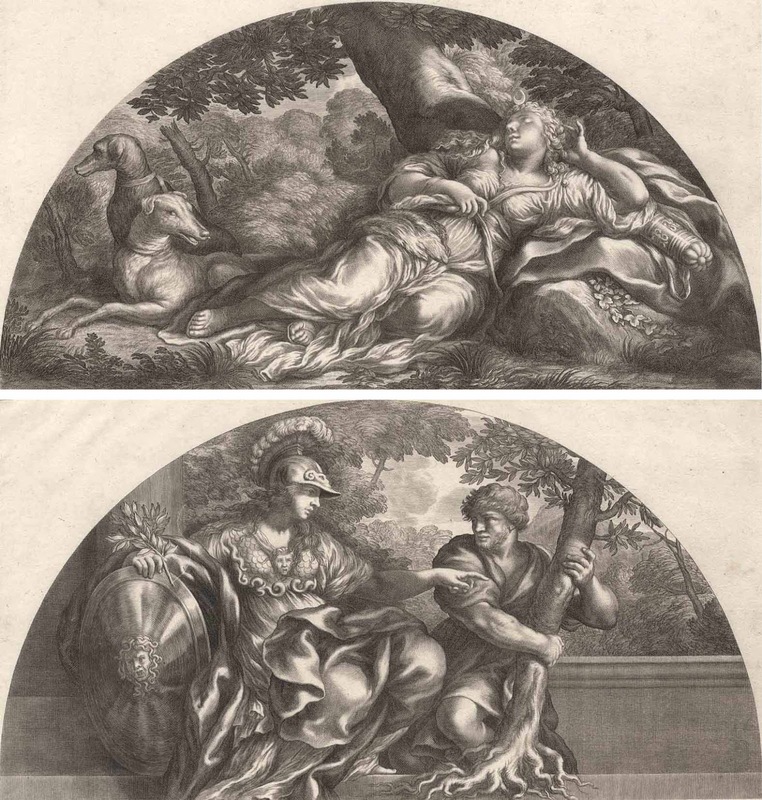 Two engravings on laid paper with margins as published, glued together and stamped with a collector’s ink seal. 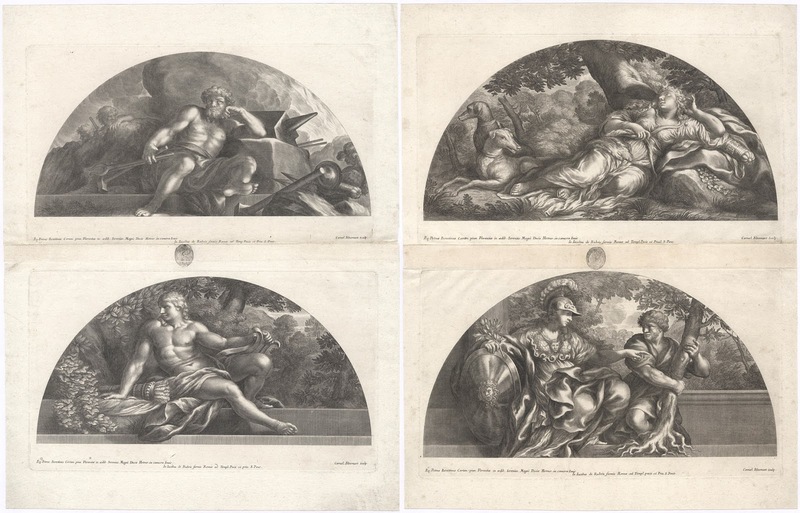 I am selling this very elegant—and very rare—assemblage of prints showing classical Greek gods with their symbolic attributes (e.g. 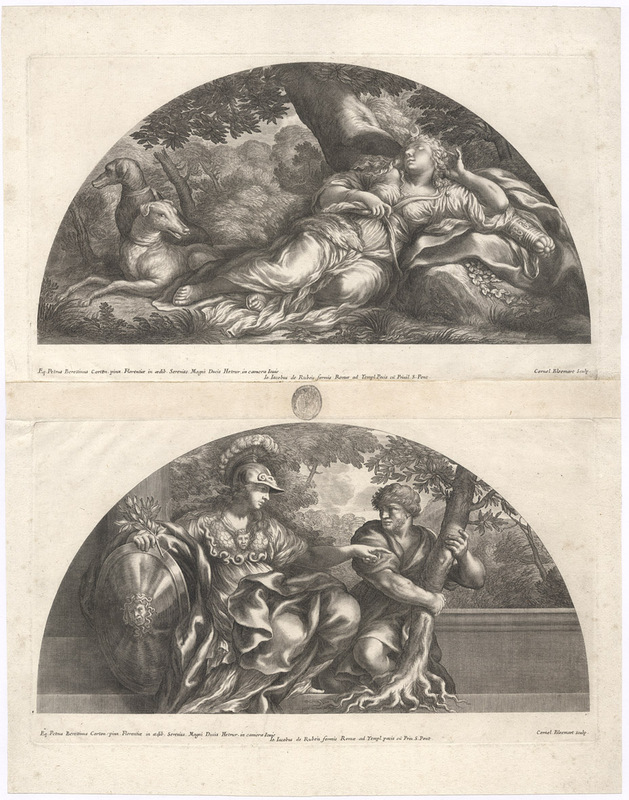 Diana with her sickle of the moon on her forehead quiver and hunting dogs and Minerva with her armour, shield, helmet and an olive branch), for the total cost of AU$239 (currently US$179/EUR150.61/GBP132.35 at the time of posting these engravings) including postage and handling to anywhere in the world. Note: In my previous post I offered the other two prints from the same series of four plates. 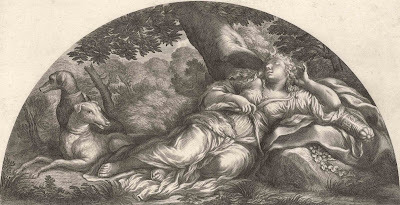 Less obvious is Minerva’s connection with childbirth and here I wish to draw upon this goddesses’ own birth and it is a VERY unusual story! My version of the story of Minerva’s childbirth is that her mother, Metis, was swallowed by Jupiter (after tricking her into becoming a fly) because Jupiter wished to ensure that Metis would be unable to have a child that could grow up and replace him as the boss of heaven. From this point in the story it becomes really fascinating. 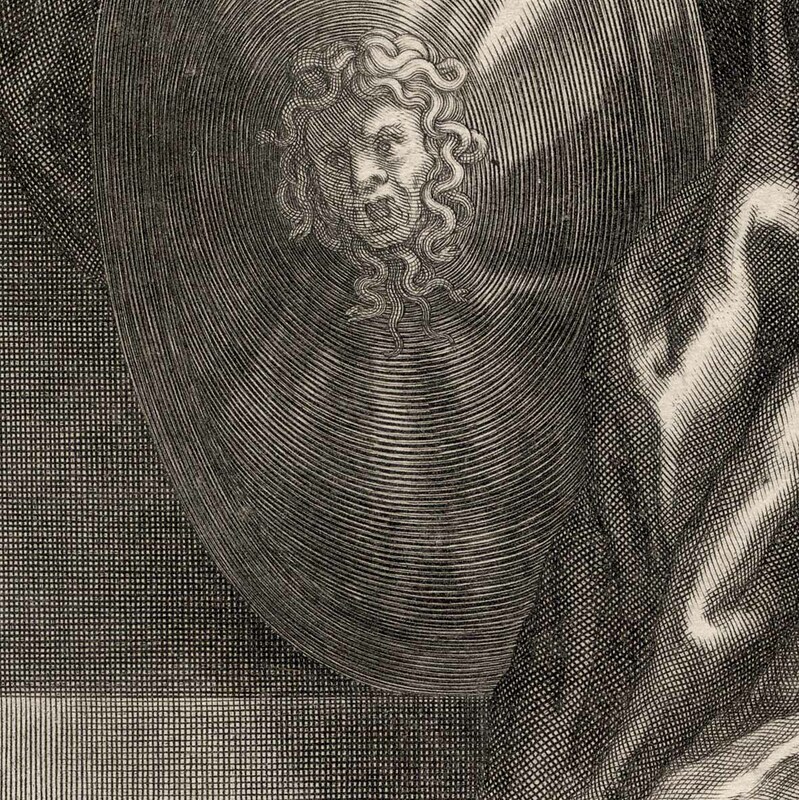 Metis the fly in Jupiter’s stomach starts to forge armour for her developing foetus. 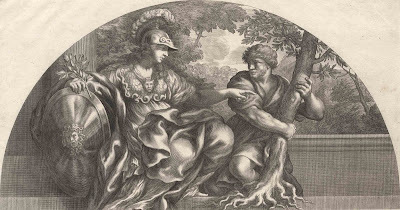 The racket that Metis makes doing her metal work for the armour gives Jupiter a serious headache and he discusses options of how to remedy his sore head with the god of the forge, Vulcan (see the previous post featuring the print, “Vulcanus”). 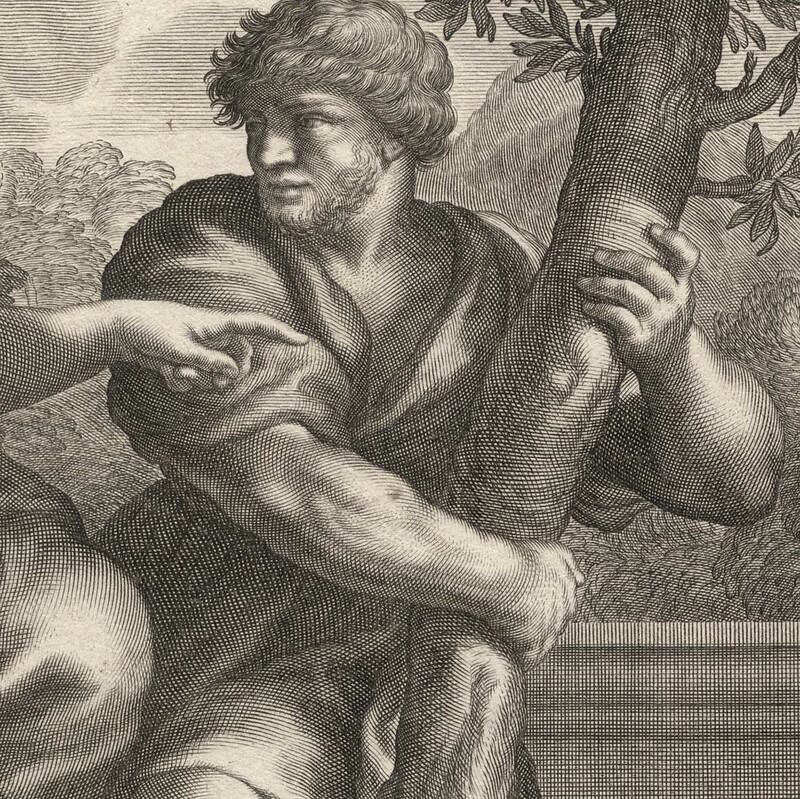 Vulcan’s manly solution to Jupiter’s request for help with his pounding headache is swift and helpful as he splits Jupiter’s head with a hammer. 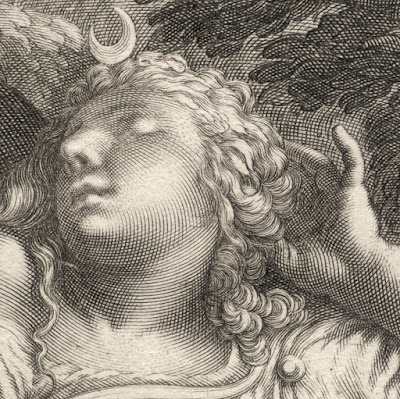 Interestingly, and unexpectedly, Minerva, who was once Metis’ foetus but has developed into an agile young lady freshly born leaps out of the cleft in Jupiter’s split head to take on governance of the heavenly realm. 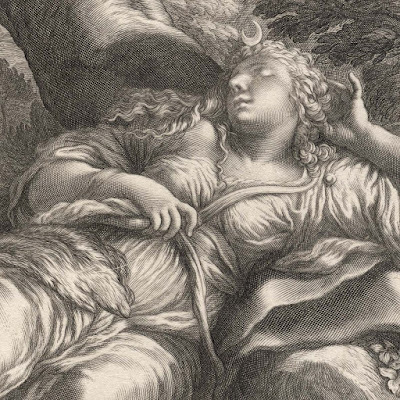 In the lower print showing Minerva clad in her armour there is one other figure that adds another dimension to Minerva’s connection with childbirth: the mythical figure of Cecrops (aka Kekrops) holding a tree. For those unfamiliar with Cecrops, this is the legendary first king of Athens who is cherished for civilizing Attica with the institution of marriage replacing the indiscriminate and rampant promiscuity.